Only in Texas would a firefighter come up with a leather R.I.T. bag. This bag is constructed of 13-15 oz. skirting leather, saddlery hardware and harness stitched with #346 nylon cord. Leather loops hold your Paratech pry axe and air supply line. Two small D-rings allow the bag to be attached to the SCBA with a carabineer. 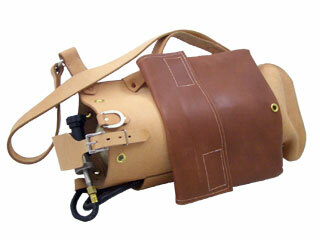 The tool pocket is made of soft latigo leather for an extra mask or tools and measures 13" x 14". Along with the grommets that allow the tank to be secured with a draw string, the bag also comes with a 3" protective flap which covers the valve and retains the tank. This allows the SCBA valve to be operated with a gloved hand. The hand carry strap is 1 3/4" and the shoulder strap is 1 1/2". Upon arrival everything will be a snug fit, but this bag will conform to the tank and the tools in time. The color of the bag will also change over time and with use. Each hide of range leather is unique and may show brands, barbed wire scratches, insect bites, etc. These do no affect the integrity of the product. The leather should be treated with a leather conditioner such as neat's -foot oil or any one of the many leather conditioners on the market. Keeping it oiled will prevent drying out and cracking. We will give this product a lifetime guarantee. Wt. 84 oz. Contents not included.